The University of Florida is a public research university located in Gainesville on a 2,000-acre campus. UF is a large school with an enrollment close to 50,000 students, yet students attest to its small campus feel. The downtown area, just two miles from school, epitomizes a true college town. 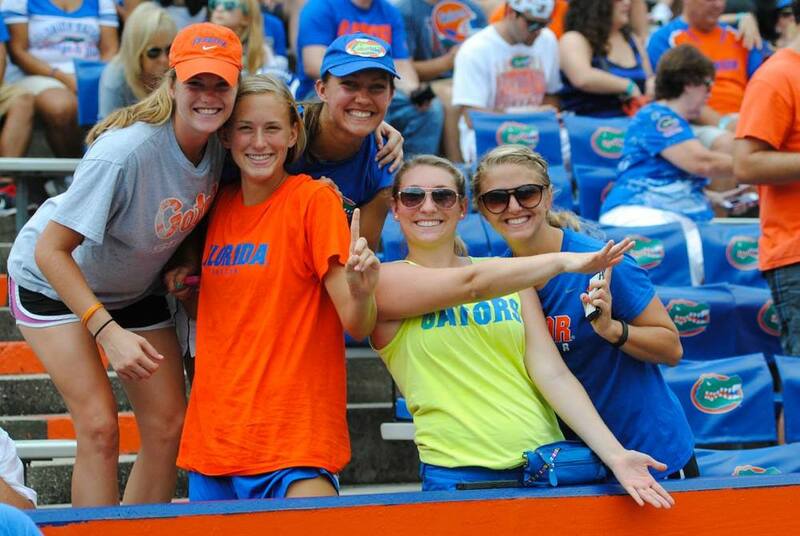 School spirit runs high with everyone turning up on game days to cheer on the Florida Gators. Transportation: The Gainesville Regional Airport (GNV) is the closest airport to campus, roughly 15 minutes away. Gainesville is also two hours or less from three international airports in Jacksonville (JAX), Orlando (MCO) or Tampa (TPA). The nearest Amtrak station is located just 14 miles north of Gainesville in the town of Waldo. Visitors can take a bus from the Amtrak station to the RTS downtown station, just 14 blocks east of campus. GMG Transport,Greyhound, Megabus, and RedCoach have pick up locations on the university campus. Stay: No one denies that The Holiday Inn Gainesville has seen better days, but it is the closest, within walking distance, to both campus and UF's nightlife. The Hilton University of Florida Conference Center is a favorite among visiting parents, located on the Southwest corner of campus. Other close by options include Hampton Inn and Suites Gainesville, Double Tree by Hilton, Wyndham Garden, and the Best Western Gateway. Coffee: Students love Coffee Culture, stating that it's hands down the best coffee around with the added bonus of a drive-thru. Mi Apa also gets raves, especially if you're looking for something strong. One parent of a graduating senior steered us towards Maude's, located downtown. At Volta they take their coffee seriously, in addition to an artisan chocolate selection. Breakfast: Bagels and Noodles is a classic spot where you can enjoy a traditional "American" morning menu or reinvent your meal by ordering pad thai or pho. Metro Diner and Peach Valley Café are local chains serving a full range of breakfast selections to hungry students. Grits and Biscuits are just some of the highlights at the Flying Biscuit, a southern comfort food institution throughout Georgia, North Carolina, and Florida. For an Insta-worthy breakfast, head to Civilization. Lunch: Italian Gator is hands down the best pizza in Gainesville for a quick slice fix. For good sushi right by campus, head to Sushi Chao, where one student states: " the Spicy Tuna Salmon Don always gets the job done!" Also convenient to UF, La Tienda serves freshly made Mexican in a casual counter service spot. For Gainesville’s best BBQ, Adams Rib Co. is the place for brisket and slow cooked ribs. Make a meal of dim sum at Yummy House, served daily between 11 am and 2:30 pm or order from their extensive Cantonese menu. Casual: To soak in the college atmosphere you can't beat The Swamp. For awesome salads, burgers, and cocktails in a buzzy atmosphere try The Top. Thin crust pizza and outdoor seating contribute to Satchel's pizza popularity. For Asian fusion, book a seat at Chopstix Bistro. Excellent thin crust pizza and eclectic outdoor seating using repurposed items such as an old van contribute to Satchel's pizza popularity. For Asian fusion, book a seat at Chopstix Bistro, or for excellent ramen head to trendy Crane Ramen. Experience joie de vivre at Alpin, an intimate French bistro downtown. There’s only 12 tables so reserve well in advance to enjoy some of Gainesville’s best Italian dishes at Manuel’s Vintage Room. A Step Up: If you want the best steak in Gainseville, Mark's Prime is "the place to be," says a fan. Dragonfly is a contemporary izakaya offering tapas-style Japanese pub fare. For upscale Italian reserve a seat at Manuela. Late Night Snack: One student told us: "This is an easy question! Just order Pokey Sticks from Gumby's Pizza. Late night, this is the cheesy bread concoction that you want to be munching on!" Looking for something sweet? Midnight Cookies serves fresh baked cookies till 2 am, Karma serves Everyone's favorite ice cream, and Mochi is Gainesville's go-to for frozen yogurt. Local Attractions: If it's not game day, you can still visit Ben Hill Griffin Stadium. Hike the trails at Paynes Prairie, Florida's State Park, or explore Kanapaha Botanical Gardens. Visit the Florida Museum of Natural History, which is located on the UF campus. Just toured the University of Florida Campus? Are you a UF student, parent or Alumni? Fill out this 2 minute survey to supplement our Daytripper University Guide for University of Florida!